Companies around the world are embracing a new type of workspace when designing their offices, hybrid and mobile friendly. This isn’t a surprise, as recent studies show that employees are spending 50-60%¹ of their time at the office away from their desk. 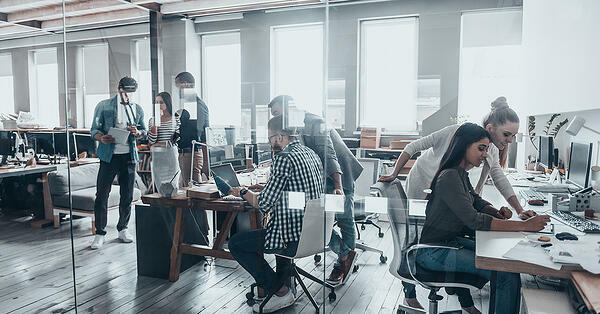 Companies and organizations are looking for unified communication solutions that not only support their workforce communications, but also its mobility. Because of this, it’s important that you stay up-to-date on the current state of IP devices on the market that support this freedom of movement within an organization. Two of the most common solutions out there are DECT and WiFi Voice, lets go over the pros and cons of both. Tried and true, DECT technology is one of the most reliable options out there. For over 20 years telephony specialists and installers have been turning to the DECT base station and handset combo to bring mobility to communication deployments. With good reason too, DECT was specifically design for voice applications. The system operates on its own isolated frequency, meaning voice quality hardly ever suffers unless you leave the range of the base station. More-over, if the range needs to be extended the technology is there to do it in the form of signal repeaters and multi cell systems. As time goes on technology will continue to improve right along with it. Before VoIP there was ISDN, before ISDN we had the PSTN; I won’t take us all the way back to when telegraphs were the revolutionary way to communicate, I think you get where I’m going here. The UC industry is seeing a similar situation as WiFi voice stability is improving and becoming a more scalable solution for VoIP. Businesses are moving to mobile friendly floor plans, we know this, and wireless networks are already becoming a status-quo in the workplace. As long as you’re creating a WiFi solution for a customer’s IT solution, you can merge their mobile UC needs right along with it. This means a lower deployment cost for you and your customer, an easier installation and configuration process, and a streamlined infrastructure. Just like with DECT though, there are pitfalls with WiFi voice. You may have experienced one of them if you decided to give WiFi voice a shot as little as a couple years ago, the consistent quality of a call is just not as good as DECT. This is primarily due to multiple device types using bandwidth through an access point. Unlike a DECT deployment, the WiFi AP is processing VoIP devices, laptops, and smart phones all at the same time and in varying amounts. QoS (Quality of Service) standards are still developing in the industry when it comes to optimizing WiFi access points for VoIP mobility. That being said, large strides are being made that is causing WiFi voice to catch up with DECT quality. Technology manufactures aren't in the dark about the cost saving benefits and superior infrastructure opportunities with WiFi voice. When it comes to larger mobile unified communications deployments, WiFi voice is going to be the new standard in the same way VoIP became the new standard over ISDN/PSTN. QoS standards are playing a huge part in this. At Grandstream for example, our GWN series of WiFi access points have been developed with WiFi voice in mind. Advanced QoS standards have optimized WiFi VoIP handsets, such as our WP820, so they can perform over our access points nearing the same quality as a multi-cell DECT deployment.